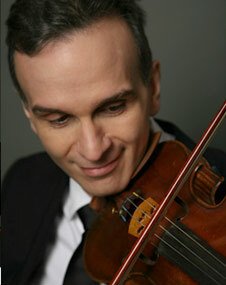 Born in America, violinist Gil Shaham moved to Israel at the age of 7; three years later, he made his concerto debut. In 1988, at age 17, he garnered wide acclaim when he stepped in at the last minute for Itzhak Perlman in a London Symphony Orchestra concert. 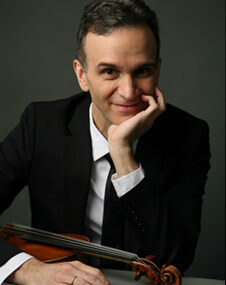 Since then, Shaham has maintained a top international career; the violinist, who lives in New York City with his wife, violinist Adele Anthony, and their three children, comes to Davies Symphony Hall Feb. 8 as part of the San Francisco Symphony’s Great Performers Series. Accompanied by pianist Akira Euguchi, he’ll play the Suite No. 2 by William Bolcom, Nigunim by Avner Dorman, Bach’s Partita No. 3 in E, and Beethoven’s Kreutzer Sonata. 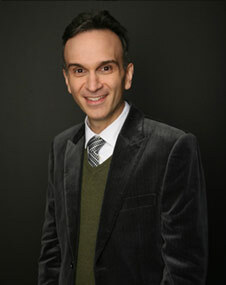 He spoke to SFCV by phone from his home in New York. You’ve always had a great rapport with Michael Tilson Thomas and the orchestra in San Francisco. Last time you were here, you played the Brahms Concerto. This time, you’re appearing in recital. Tell us about the program. Yes, I’m very excited about this program. I just feel so lucky with what I do. Over the last seven seasons, I’ve been working on these solo Bach sonatas and partitas. These are pieces I learned as a student, and somehow never dared to perform until about seven years ago; I just thought, If I don’t start playing it now, it’s never going to get better. I just have to start doing it! Like so many others have said, besides the pleasure of hearing these pieces, there’s no greater joy than playing Bach. That’s how that came about. With Akira, besides being a good friend, he’s also one of my great heroes. We’ve been playing together more than 20 years. When we rehearse, it’s very easy — a lot of the communication is almost nonverbal. We’ll play something and just sort of look at each other, and somehow we fix everything that’s on our minds. So he was very keen to do Avner’s piece, and so was I. Bill’s [Bolcom’s] piece was a commission, and it seemed appropriate to end the program with Beethoven’s Kreutzer Sonata, one of the great masterpieces of the literature. Dorman’s Nigunim and Bolcom’s Suite No. 2 were both composed for you, weren’t they? Yes, and I was lucky enough to collaborate with both of these composers. Avner’s piece was a co-commission between my sister, Orli, myself, and the 92nd Street Y in New York. It was maybe two seasons ago that Orli and I played a program of music based on Jewish folk heritage; we’ll be releasing that recording in the spring. 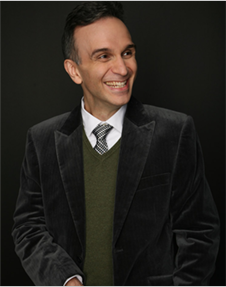 We wanted a traditional-based piece, and Avner’s first reaction was that he wanted to write music of the lost tribes of Israel. His music is decidedly more Sephardic and less Ashkenazi than the others, and the sonata he wrote for us — well, I couldn’t be more thrilled! I love the piece. It seems to go over really well with audiences. We premiered it in 2011, and I’ve played it with Akira and Orli. Akira loves the piece — after the first time we read it together, he said, “Gil, we have to play this in Japan.” So after we play it in San Francisco, we will go to Japan in March and play it there. The way Avner describes it is that the first movement is based on a Libyan incantation. The second movement is based on a Georgian wedding dance, and the final movement is based on Macedonian dance rhythms. A nigun is an instrumental work; it has the unusual property that the melody starts on a note and wanders off, often in an improvisatory manner, and ends up back at the same note. Nigunim is the plural. It’s an instrumental piece that’s meant to transcend words. Avner said that if I played this for someone who only spoke Arabic, he would understand it, the same way that if I played it for someone who only spoke Hebrew, he would understand it. That’s the idea behind it. Tell us a little about the Bolcom suite. It’s very new, isn’t it? Yes, and it also has a nigun in it. The third movement is called “Northern Nigun.” It’s a little tongue-in-cheek, but also very much following the tradition. This was a commission by Music Accord. I had played some recitals for them a few years back, and they asked if I could give them a name of an American composer from whom they could commission a piece. I was thrilled when Bill Bolcom accepted. He’s a living legend. I got to know him a little when I was playing his Violin Concerto in Toronto, and he came to some rehearsals there. I’ve always loved his writing, and I’m so digging this piece. Some parts are very tongue-in-cheek, some are light-hearted, some are very sunny, and others are very poignant and beautiful. It’s all for solo violin. I do think music has a way of capturing its time. 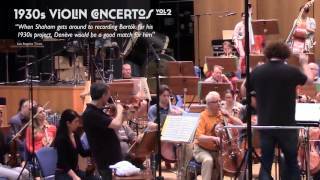 … In the Barber Concerto you can hear urban America. You can hear skyscrapers and sirens, the traffic down Broadway. Maybe the starting point for this was the solo sonatas and partitas by Bach. You know, when Beethoven wrote about Bach’s solo sonatas and partitas, he said those pieces are proof that a composer can write great music even with shackles on. I think that’s exactly what Bill has done with this suite. It’s nine short movements, each with a different character, exploring all sorts of different ranges of the violin. And I haven’t performed it yet; the first performances will be in Aspen, Colorado [on Feb. 5]. So, your San Francisco appearance will mark one of the work’s very first performances after that? Yes, and I can’t wait to see how the piece feels, and how it goes over. You spent much of the last year playing the great violin concertos of the 1930s. Are these works that are still somewhat unappreciated, do you think? Why did you start this project? To be honest, I really started the project as an excuse for me to play some of my favorite music. But it is kind of an interesting coincidence that within eight years, 1931 to 1939, there is this long list of composers who wrote concertos for the violin. When I read the list to a friend, he said, “Gil, you’ve just named all the great composers of the 20th century.” Suddenly, you have concertos by Stravinsky and Prokofiev and Bartók, Alban Berg, Arnold Schoenberg, Samuel Barber, Roger Sessions, Benjamin Britten, William Walton, Darius Milhaud, Karl Szymanowski, Ernst Bloch. I’m leaving some out, but they all wrote violin concertos in those years. It’s curious, because composers before that didn’t have the need to write violin concertos. Ravel famously said, “Why should I write a violin concerto? Mendelssohn already wrote one.” Gershwin didn’t write one. I don’t think it was a particularly lucrative proposition for composers. I guess these days I’m kind of going through my midlife crisis, just sort of reconsidering all my follies of youth! So, how to explain this flowering of violin concertos in that decade? I don’t have any answers. But I do think it’s interesting. It’s been a few years now that I’ve been playing these pieces. A few years ago I was playing in Washington, and a man came backstage. He said the 1930s was a very special time; people lived with tumult and trepidation and this feeling that they were on the edge of a volcano, waiting for the eruption. There was the Depression and the Dust Bowl. I’m not sure how that relates. But I do think music has a way of capturing its time. I remember Hugh Wolff talking about the Barber Concerto. He said that in the third movement you can hear urban America. You can hear skyscrapers and sirens, the traffic down Broadway. It’s true! By the same token, with Berg, you have passages where he switches between Bach’s original harmonies and this sort of weeping, lamenting violin harmonized with these very poignant 12-tone chords. Maybe that does capture the sense that Old Europe is gone, and what will happen now? By my calculations, you’ve been concertizing now for the better part of 30 years. Are there works you have not played that you still want to play? Yes, definitely. For one, Bill’s piece, which is very much on my mind. But there are some other things I’ve never done. I’ve never played the Shostakovich concerto, and one day I really have to get around to it. In the next few years, I hope to play Roger Sessions’ concerto, which I’ve never done before. I like the piece; it’s not as thorny as other pieces by Sessions, and I think people are always surprised by it. I haven’t played all the Mozart violin sonatas, or all the Beethoven, and I’ve only done a handful of the Bach accompanied works. There are also some pieces I’ve played many times, but never played well. I guess these days I’m kind of going through my midlife crisis, just sort of reconsidering all my follies of youth! Speaking of youth, I’ve noticed you’re a Facebook and twitter participant. Is this something that’s required of artists now, or do you actually enjoy it? I have to confess that I do have Facebook and twitter accounts, but the person who runs them is not me. It’s sort of run by the recording company, and my publicist. They forward things to me. Basically, it’s been explained to me that it is required — now you can really reach people this way. But at home, Adele and I are basically chasing after the kids most of the day. And I have a hard enough time answering phone messages, emails, regular mail, and everything else. I guess I’m really not very well-organized. Georgia Rowe has been a Bay Area arts writer since 1986. She is Opera News’ chief San Francisco correspondent, and a frequent contributor to San Francisco Classical Voice, Musical America, San Jose Mercury News, Contra Costa Times, and San Francisco Examiner. Her work has also appeared inGramophone, San Francisco Magazine, and Songlines.